I am curious about the research that went into the writing process. The science felt plausible and wasn't too technobabble-y, so was that a function of the research you did, or do you have some background in genetics? And by the way, just to give you an idea of how current the events portrayed in Evo are, here’s a link to a news report that circled the globe at the end of November last year, about a Chinese geneticist who used a gene editing technology called CRISPR to engineer twin baby girls whose DNA was designed to resist the HIV infection. This means that we already have genetically engineered babies in this world and I don’t know whether to be scared or happy about it. The truth is we have no idea how this will affect future generations, as even one tiny altering in our DNA could lead to more changes and they might be catastrophic. But let’s be optimistic and hope for the best. The characters all felt fully fleshed out, with a lot of history that is referred to but not elaborated on in the text. Do you tend to have all of the characters' history done ahead of time, or is a lot of it a mystery to you as well? When inspiration strikes and I have an idea for a new book, I always get the characters done first. I need to know everything about them, from when they were born and what experiences they had in high school, to why they are who they are today. Then I start writing and after I’ve written about a quarter of the novel, I’ll stop and work on my characters again. And this is where I need to know them as well as I know myself. Their deepest desires, darkest fears, best-hidden secrets. Everything. And once I do that, do you know what happens? They start making their own decisions and don’t listen to me anymore! Ungrateful little…well, you get the idea. Ernest Hemingway used to say that “when writing a novel, a writer should create living people,” so when my characters start telling me where they want to go, that’s when I know I’m working with people and not mere characters anymore. 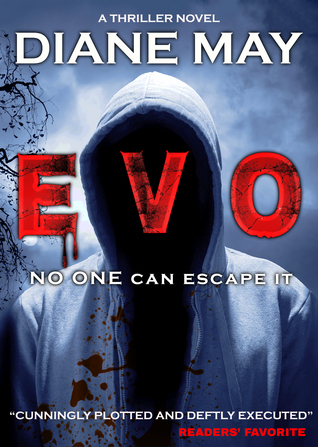 There were different plot threads in Evo, and at first, it didn't seem to be connected. What was the inspiration for them? The unfolding of the story itself was the inspiration. As the novel kept advancing and my characters came to life, the plot thickened, so to speak. At the beginning, I only had Livio Marchiori, Maya Blake, Charles Lambton, Doc, and The Hypnotist. Soon after, Alex O’Neal joined them and he added another thread to the story. Then Maya’s dad and the funny thing here is that all the chapters featuring him were written during my second draft. Which location was your favorite to write about? Verona. No doubt about it. Although Transylvania is also amazingly beautiful and comes a close second. But Verona is in my heart and will always stay there. I actually wanted to include many more details about this wonderful city, but my husband asked me whether I had changed my mind and decided to write a tour guide instead of a crime thriller, so I had to cut them out. What were the biggest influences in writing this novel? Or writing in general? The truth is, all of the books I read influence me and my writing one way or another. But what got me started writing was Isaac Asimov’s The Naked Sun. I read it when I was 13 years old and loved it so much that I didn’t want it to end. So when it inevitably did, I decided to continue the story because I couldn’t bear the thought of having to leave the amazing world he had created. I soon discovered that my words didn’t seem to hold the same magical power though, as my characters seemed adamant on remaining lifeless stick figures and they didn’t jump off the page the way his did. But I kept at it, I read and wrote, and…now I am here. There are many writers who have had an influence on my writing. I learnt how to create suspense that raised the hairs on your back from Tess Gerritsen; how to write detailed action scenes from Tom Wood; how to describe feelings and emotions from Kristin Hannah; how to keep up the tension throughout the novel from Lee Child; how to write twists and turns from Dan Brown. They are all amazing writers and I can only hope that one day I’ll write as well as they do. Woah! First of all, I LOVE that cover!! Second, great interview! I love learning more about the writing process! Third, I'm definitely going to have to check out this book!